Kids Who Eat More Saturated Fats May Turn Out To Be Stressed Out Adults! You have probably heard that when it comes to food, young people can get away with eating whatever they want to eat because they have faster or better metabolism. In fact, we all know those kids who can eat ‘junk food’ and never gain weight. . But when it comes to being healthy, it is not just about being skinny. Aside from body weight, a high fat diet may have a major psychological impact on young people - especially adolescents. (Adolescence begins with the onset of physiologically normal puberty, and ends when an adult identity and behaviour are accepted. This period of development corresponds roughly to the period between the ages of 10 and 19 years, which is consistent with the World Health Organization’s definition of adolescence, National Institutes of Health). Reportedly, there is some recent evidence that adolescent rats who consume a diet high in saturated fats have a harder time coping with stress as adults. This lead researchers to conclude that “lifestyle decisions made during adolescence—even those as simple as your diet—can make a big difference in our ability to overcome every day challenges." Changes in the structure of brain regions associated with PTSD, including the amygdala and the prefrontal cortex. More problems with associative and non-associative learning processes and an impaired fear-startle response. Reduced extinction of fear memories. More difficulty actually determining level of threat (“This suggests that obesity and associated metabolic alterations may predispose individuals to PTSD-related psychopathology,” the report says). Although many kids and teenagers’ waistlines don’t seem to be affected by eating foods high in saturated fat, there is still cause for concern. Reportedly, the “teen years are a very critical time for brain maturation, including how well (or not) we'll cope with stress as adults." More research is needed (especially since this study could not actually use adolescent children for testing), but the findings may very well be applicable to young people. Researchers are also working to determine if the effects of a high saturated fat diet can be reversed once an adolescent starts to eat more healthily. 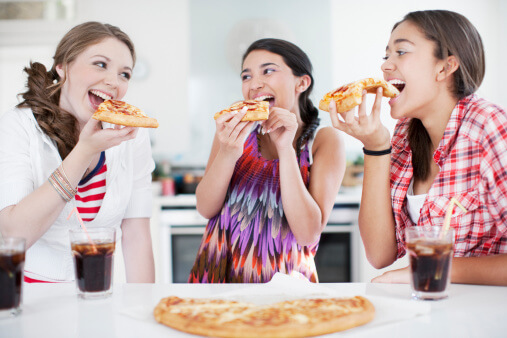 Remember that adolescents may not immediately show the physical signs of a bad diet, but it certainly may be affecting their brains (especially during such a critical stage of brain development). Learn to distinguish between Good fat vs. bad fat. It is important to be knowledgeable (and teach your kids, the younger the better) about foods that are both good and bad for you. Fat that comes from whole foods, like avocado and almonds, are sources of healthy fat. To learn more about healthy fats, read here. Saturated fats, which may also increase the risk of heart disease and other metabolic issues, are found in a lot of dairy products and other animal foods. This does not mean that saturated fats should be (or even can be depending on whether you eat meat or not) completely avoided. Pizza and cheese are the biggest food sources of saturated fat in the U.S. diet, and other dairy products and meat products are also are also major contributors. Keep in mind that all foods contain a mix of fats. Even “healthy” foods like chicken, fish, nuts, and oils do contribute some saturated fat to the diet, though they are much lower in saturated fat than beef, cheese, and ice cream. And it would be a mistake to cut back on nuts, oils, and fish to minimize saturated fat. As a general rule, it’s a good idea to keep your intake of saturated fats as low as possible. We can’t eliminate saturated fat from our diets completely, because foods that are good sources of healthy fats—olive oil, peanuts, salmon—also contain a little bit of saturated fat. Processed meats, like salami, are also very high in saturated fat. The key, like with most foods and things regarding our health, is moderation. Whether it’s involving them in meal prep or taking them to the farmers’ market, studies have shown that making eating healthily fun and interactive helps children carry these good eating habits into adulthood. Again, the younger you can start the better. You cannot stress eating healthily without actually eating healthily. Your kids really do look up to you and will likely follow your lead. So make healthy meals at home, exercise regularly and show them that you can still go out to eat and make healthy decisions. Finally, one of the best ways to help ensure that your child is both physically and mentally healthy is to have him or her take a nutrient test. This test will determine if your child has any nutrient deficiencies or imbalances. If your child does, you can work with your pediatrician or a competent healthcare professional about possibly necessary diet tweaks or taking good quality supplements.